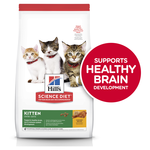 Hills Science Diet Kitten Healthy Development provides your kitten with precisely balanced nutrition to help them grow and develop to their full potential. 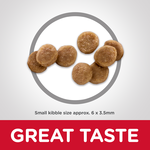 This premium dry food is made from high quality, natural ingredients with no artificial colours, flavours or preservatives. 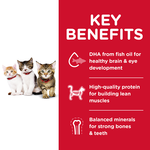 Hill?s Science Diet Kitten Healthy Development contains natural DHA from fish oil to support healthy eye and brain development, as well as a clinically proven antioxidant blend including vitamins C & E to support a healthy immune system. 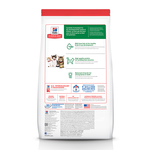 Looking for a kitten food free of corn, wheat and soy? 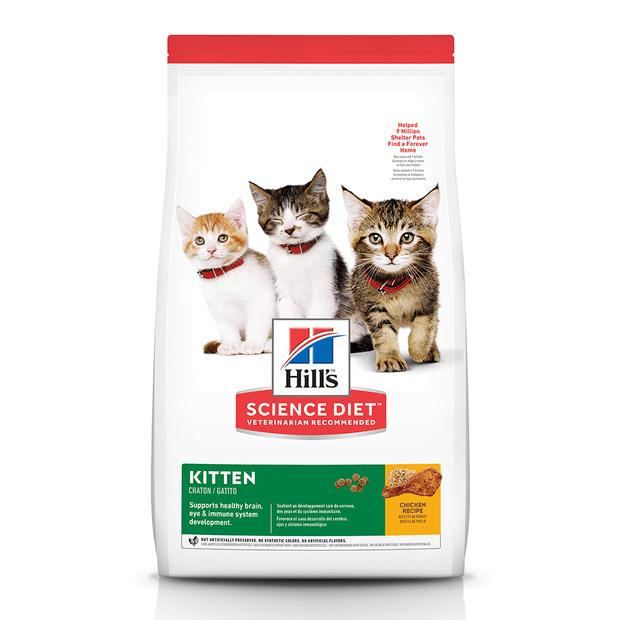 Try Hills Ideal Balance Kitten. Need to stock up on canned food too? 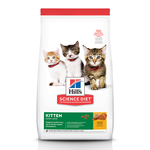 Check out Hills Science Diet Kitten Liver & Chicken Entree and Tender Chicken Dinner. Chicken, Whole Grain Wheat, Corn Gluten Meal, Chicken Fat, Whole Grain Corn, Chicken Liver Flavor, Dried Beet Pulp, Soybean Oil, Dicalcium Phosphate, Fish Oil, Calcium Sulfate, Lactic Acid, Egg Product, Flaxseed, Choline Chloride, Powdered Cellulose, L-Lysine, Potassium Chloride, Taurine, Iodized Salt, vitamins (Vitamin E Supplement, L-Ascorbyl-2-Polyphosphate (source of Vitamin C), Niacin Supplement, Thiamine Mononitrate, Vitamin A Supplement, Calcium Pantothenate, Biotin, Riboflavin Supplement, Vitamin B12 Supplement, Pyridoxine Hydrochloride, Folic Acid, Vitamin D3 Supplement), minerals (Ferrous Sulfate, Zinc Oxide, Copper Sulfate, Manganous Oxide, Calcium Iodate, Sodium Selenite), DL-Methionine, Calcium Carbonate, Oat Fiber, Mixed Tocopherols for freshness, Natural Flavors, Beta-Carotene, Apples, Broccoli, Carrots, Cranberries, Green Peas. 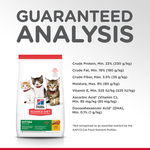 I love this product because my kittens love it. I know they are getting the best possible level of nutrition and this opinion has been reinforced by their vet. I can’t really comment on the product quality however my kitten is not a fan of this. I’ve road tested 3 other products and she likes all but this one. I wish I had not purchased such a large bag.